The Trust for Public Land has been helping the U.S. 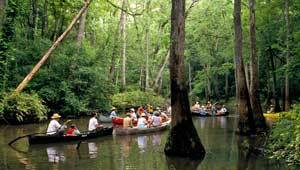 Fish and Wildlife Service expand Bond Swamp National Wildlife Refuge, along the Ocmulgee River south of Macon. TPL has added more than 1,500 acres to the refuge—more then 580 acres in the last year alone. One of the state's premiere stopping spots for migratory ducks and other waterfowl, the refuge is also home to bald eagles, wood storks, black bears, and alligators. And as a planned link in Macon's Ocmulgee Heritage Greenway, the refuge will increasingly welcome human visitors.